The Norwegian Synod was organized in 1853. Six years later, the synod’s first joint undertaking was the establishment of a professorship for the training of pastors. The position officially began on October 14. This date became known as “Founders’ Day” and had such importance to the Norwegian Synod that it became the dedication date of many buildings for congregations and synodical institutions. In 1918, the synod was reorganized as the Evangelical Lutheran Synod to “continue in the old doctrine and practice.” Since then, the synod has observed the dual anniversaries of 1853 and 1918. For many years after the synod’s reorganization, the mid-October date continued to be observed as a public declaration that the ELS is the rightful successor to the teachings of the Norwegian Synod which held to the two fundamental principles of the Reformation: that the Bible is the inspired Word of God and that salvation is received by grace alone. During this centennial year, the ELS follows this tradition by observing “Founders’ Day” as a special opportunity to thank and praise God for one hundred years of His wonders and blessings. He has richly and daily provided for us. He has purchased and won us from all sin through his Son. He has sanctified and kept us in the one truth faith. May grateful hearts overflow with thanks and praise. 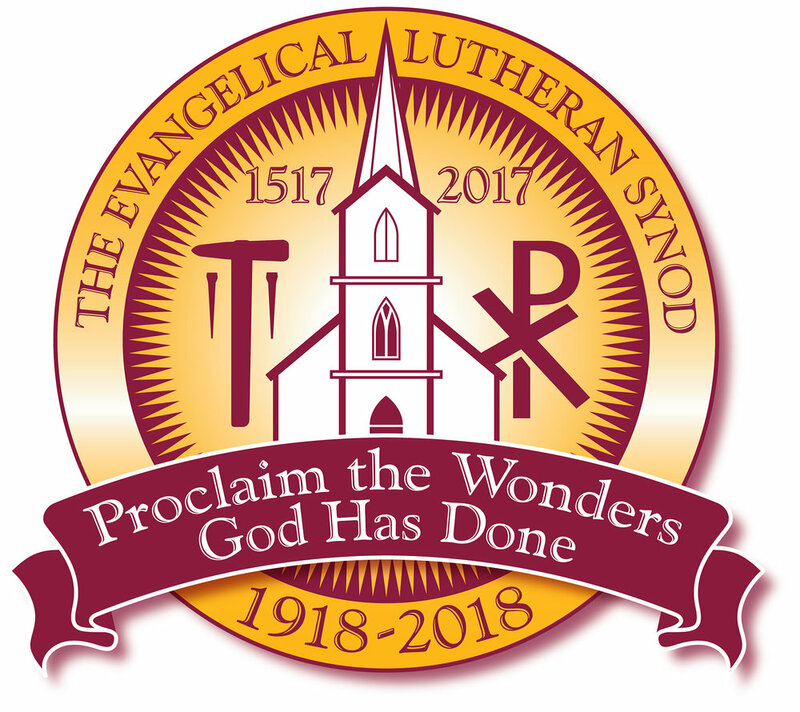 The synod’s Centennial Committee announced the anniversary logo to be used for two significant anniversaries: the year 2017 marks the 500th anniversary of the Lutheran Reformation and the year 2018 marks the 100th anniversary of the reorganization of our Evangelical Lutheran Synod. At the center of the logo—which has been designed by Bethany Lutheran College professor Andrew Overn—is the Lime Creek church building located near Lake Mills, Iowa. It was here that the synod was reorganized in 1918 to continue in God’s word and Luther’s pure doctrine. To the left is a hammer and two nails, reminding us of the day when Martin Luther posted the “Ninety-Five Theses.” To the right is the symbol of the Evangelical Lutheran Synod, the “Chi Rho.” This symbol is made from the first two letters of “Christ” in the Greek language and emphasizes the importance of keeping Jesus at the center of our teachings. The dates at the top of the logo are the quincentennial anniversary dates of 1517–2017 for the Reformation. The dates at the bottom of the logo are the centennial anniversary dates of 1918–2018 for the ELS. The banner across the logo bears the anniversary theme, “Proclaim the Wonders God Has Done,” from a hymn of Martin Luther. During these anniversary years, we wish to look back both at what God has done and also to proclaim his name, his deeds, and his salvation to a new generation and to a generation yet to be born.